HOURS: Wednesday through Sunday, 10 a.m. to 5 p.m.
Extended hours during the NHRA Winternationals and Auto Club NHRA Finals. Also, hours change during the annual Los Angeles County Fair. HOLIDAY CLOSURES: Most U.S. Major Holidays including Easter, Memorial Day, Independence Day, Thanksgiving, Christmas Day and New Year’s Day. 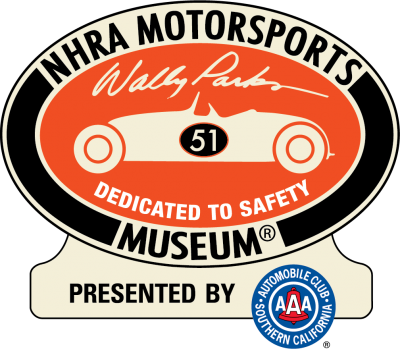 ADMISSION PRICES: Current Museum and NHRA Members are admitted free. Admission for non-members is $10 for adults, $8 for seniors 60 and older, $8 for juniors 6 through 15, and free for children under the age of 5. AAA discount available. L.A. COUNTY FAIR: During the annual Los Angeles County Fair in September, the Museum observes Fair admission prices and hours of operation. Visit lacountyfair.com for more information. For exact directions from your address use Google Maps.